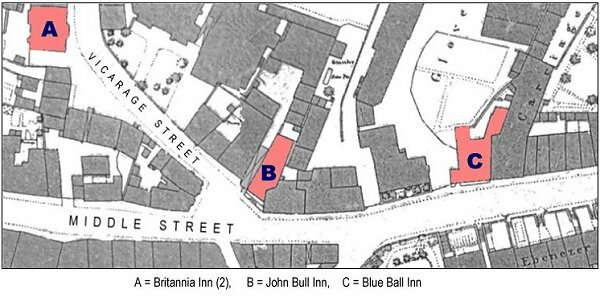 Few records exist and, as far as I am aware, no photographs of the John Bull Inn (marked 'B' on the map below) which was at the corner of Vicarage Street and Middle Street, being listed in both roads at various times. A good description of the property is given below in a newspaper report. It was a public house rather than a simple beerhouse because, despite only apparently being around for just over thirty years, it is consistently listed as an inn and the licensees referred to as Innkeeper or Public House Keeper rather than the more simple Beer Retailer which would be suggestive of a small combined grocer/beer retailer premises typical of the period. Indeed in February 1834 the Sherborne Mercury reported the sale of the John Bull which is rather indicative that it predated the Beerhouse Act 1830 "Sale of substantial dwelling house called the John Bull Inn occupied by William Woodrow and newly built dwelling house standing in yard with entire gateway leading thereto and yard and garden adjoining, and wood-loft and store owned by W & E Whitby, and three cottages adjoining." In 1838 William Woodrow was made bankrupt although his bankruptcy was annulled in December 1838. In its edition of 11 June 1853, the Western Gazette reported "On Tuesday evening two men named Bryant and Davis, were drinking at the John Bull Inn, in this town, when a quarrel arose. 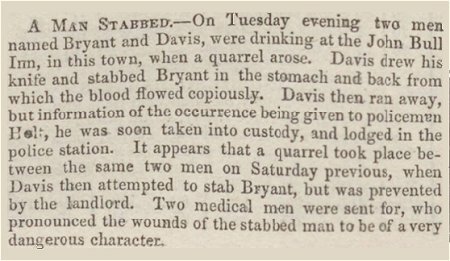 Davis drew his knife and stabbed Bryant in the stomach and back from which the blood flowed copiously. Davis then ran away, but information of the occurrence being given to policeman Holt, he was soon taken into custody and lodged in the police station. It appears that a quarrel took place between the same two men on Saturday previous, when Davis then attempted to stab Bryant, but was prevented by the landlord. Two medical men were sent for, who pronounced the wounds of the stabbed man to be of very dangerous character." The John Bull caught fire in 1863 and was completely destroyed, chiefly because the primitive fire brigade of the day had little or no water with which to quench the flames. At this time mains water was still not available in the town and the fire brigade only had the water they could carry in their horse-drawn fire engine - maintained by the West of England Fire Insurance Company. On Tuesday morning, one of the most dreadful fires ever known in Yeovil occurred at the point where Middle Street and Vicarage Street unite. At the junction of these streets, stood the John Bull Inn, of which Mr John Gulliver was landlord, and three cottages inhabited by Mr E Baker, Mr Maniford, and Mr Morris. These premises had a high warehouse on one side, and a shop and another inn, the Blue Ball, on the other. All four of the houses were thatched. The John Bull was a very old-fashioned place, with the usual inn gateway; and displayed on its front a wonderful picture of a jolly-looking individual in a cocked hat, holding a pipe and a glass, and looking altogether very comfortable in the contemplation of nothing in particular. Mr Gulliver's family consisted of himself, and wife, and two children - a boy and a girl - the former (Albert) aged about ten, and the latter about thirteen. There were also two other persons sleeping in the house - an ostler names James, and a man named Warr. It is said that Mr Gulliver noticed an unusual glare some time previous to the actual discovery of the fire; but remembering that it was a clear moonlit night, he thought there was nothing particular the matter, and took no further notice. The actual discovery seems to have been made by Mr Hurdle, provision merchant, and his wife, who live in Middle Street, exactly opposite. 3 March "John Bull Inn, Middle Street, on fire. Alarm at 3:15, the Brigade Engine first on the spot at 3:30. Three lives lost viz. Mrs Culliford (sic), Son and Daughter. The premises insured in the West of England, being the property of the Walters family. The engine having been taken to the Engine House at 8:00 was again taken to the same at 12:30 but no further damage was done to any of the adjoining premises." Friday 20th March "...the Secretary shall write to the officers to ask a subscription towards obtaining a sufficient sum to pay the 70 men employed by this Brigade at the fire in Middle Street." Monday 27th April "The Secretary handed the sum of £8-15-0 to the Treasurer being the subscriptions received from the West of England & Atlas Fire Insurance Company towards expenses of the late Fire in Middle Street paid through Mr Whitby as Agent to the West of England Office... Proposed and Seconded that the men employed at the fire in Middle Street be paid by the Treasurer at 8 o'clock PM on Thursday April 30 At the Corn Exchange & that Mr Woodman be asked to warn them the time and place. The helpers were duly paid and listed, the £8-5-0 (sic) being disbursed in sums of 3s.6d., 1s.6d. and 1s. according to the tasks performed. The subsequent inquest into the deaths of the victims was carried out at the Blue Ball inn. In 1868 the premises of the old John Bull at the junction of Middle Street and Vicarage Street were purchased for £710 but these were subsequently sold (Brochure of the Centenary History of the Vicarage Street Methodist Church, 1969, p14). The name lived on, however, as the new John Bull Inn in Bond Street (see below) and later in the 1901 edition of Whitby's Yeovil Almanack Advertiser the 'John Bull Tea Warehouse' was advertised at 96 Middle Street. Of the licensees, Jacob Woolmington was recorded as the licensee of the John Bull in Middle Street between 1839 and 1842. He was born about 1815 in Stoford, just south of Yeovil. In the 1841 census he was listed as innkeeper in last house in Vicarage Street with his wife, Elizabeth, and their children Edwin, Emily and Gertrude. In January 1848 at the Petty Sessions "A charge of affiliation was made against Thomas Walter of the John Bull Inn, by Sarah Rogers, a girl who had been in his service. There was no corroborative proof and the charge consequently fell to the ground." In 1851 he was recorded in the census as being a glover and innkeeper of a beerhouse in Middle Street with Elizabeth and three young daughters; Emily Jane, Sarah and Harriett.. This beerhouse, at one time, was thought to have been the John Bull, but must have been a separate establishment because the John Bull was named as such and had another licensee, Thomas Walters, in 1850 and was being run by his widow, Jane Walters, in 1851. By 1861 the family had moved to Bond Street where Jacob was listed as a leather glove cutter, Sarah was a dressmaker and the other two girls were both leather glove makers. In 1871 Jacob, Elizabeth and daughter Sarah were still in Bond Street. I lost them in the records after this date. Thomas Walter was born about 1811 in Somerset and by the time of the 1841 census was the licensee of a short-lived beerhouse at Townsend, London Road (Sherborne Road), where he lived with his Ilchester-born wife, Jane, and six children. His occupation was given as a smith. In its 9 August 1845 edition the Sherborne Mercury reported "Thomas Walters, of the John Bull Inn, Yeovil, was, on the information of Mr Thomas Cole, churchwarden, fined 40s and expenses, for keeping his house open during divine service on a Sunday." Thomas died in March 1851 aged about 40 and his wife, Jane, took on the license of the John Bull. She was listed as the innkeeper of the John Bull Inn in the 1851 census that was taken on the last night of March. Living with her were her eight children aged under 16 and a house servant. Jane was listed in trade directories until Slater's Directory of 1852/3. It would appear that her son, Philip Walter, was landlord for some years. In July 1854 he was summoned for being indebted to Messrs Green of Oakhill Brewery in the sum of £19 4s 6d for beer. However at this hearing there was "so much cross-swearing as to make it certain that gross perjury was committed on the one side or the other. Judgement was deferred by his Honour until the next court. No proceedings against Walter would have been taken meanwhile, had he not commenced selling off his goods, with the supposed intention of getting out of the way. This being the case, charges of forgery and perjury were at once preferred against him." He was committed for trial and received the "lenient sentence of twelve months imprisonment, with hard labour". Certainly by 1859 Jane and Philip had moved on but I found no further record of them. The final licensee of the John Bull Inn was John Gulliver. John was born about 1818 at Henstridge, 12 miles east of Yeovil. I found little evidence of his early life although he married in July 1847 in Yeovil and in Harrison, Harrod & Co's trade directory of 1859 he is listed as the licensee of the John Bull. In the 1861 census he was listed the with his Yetminster-born wife, Sarah, and his occupation was listed as public house keeper. Also present were their 11-year old daughter, Mary Jane, and 9-year old son, John Albert. As we have seen above, Sarah and the children died in the fire at the John Bull in March 1863 and, clearly not one to hang around, John remarried four months later, in July. In the 1871 census John was listed as an innkeeper and was living with his new wife, Mary, in Bond Street where he had opened a new version of the John Bull Inn following the original John Bull burning down in 1863. John's second wife, Mary, died in December 1871. By the time of the following census in 1881 John had moved to Purse Caundle, Dorset, where he ran a beerhouse and lived with his carpenter son, William, and daughter-in-law Maria. John Gulliver died in December 1882. A snippet from the Wells Journal of 11 June 1853. 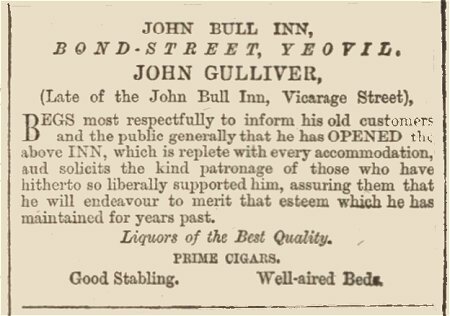 The advertisement placed in the Sherborne Mercury of 19 January 1864 by John Gulliver announcing the opening of the new John Bull Inn in Bond Street (late of the John Bull Inn, Vicarage Street). Note - Woodrow was declared bankrupt in 1838 and described as an innholder.